Leonardo is a beautiful medium fawn multiple Blue Ribbon winning full Accoyo herdsire. He continues the Likada tradition of combining the most elite Accoyo colored fibers and genetics! His sire is the Accoyo Timoteo son, Don Marcelino. Marcelino has sired such incredible fawn Accoyos as Accoyo Bear Claw (now deceased) and Accoyo Bizchoco. His incredibly fine fiber measured only 20.6 microns at over 2 years of age! His dam is out of Accoyo Royal Fawn, and the combination of their genetics has produced a large boned, densely fleeced male that we are thrilled to be putting on our colored and Accoyo females! We think that he will follow in the tradition of Accoyo Michelangelo and Accoyo Principe Dorato in throwing vibrant, richly colored offspring with the Accoyo density and brightness! He has now thrown fawns, browns and blacks! Victory’s Accoyo Macaria is a 17 micron FULL ACCOYO daughter of EL NINO's ACCOYO VICTORY! She is beautifully statuesque, bright, fine and dense! Even her AFD is 21.2 micron at five years old, 2013. Her sire, EL NINO's ACCOYO VICTORY is a multiple Blue Ribbon winning white son of the incomparable Accoyo El Nino, who himself was sired by Accoyo Caligula! With El Nino and Caligula both deceased, these genetics are rare and valuable. 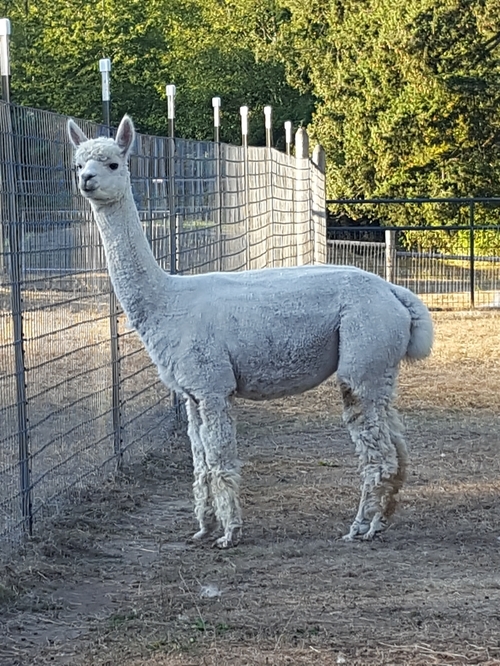 Victory is the paternal brother to El Nino's Accoyo Michelangelo...who has produced the high selling alpacas in the every auction. This included the high selling huacaya in the 2009 AOBA National Auction, where a juvenile female was sold for $29,500! That just tells us that even in the worst economic environments, the best genetics have value. Accoyo Macaria's dam, SA Accoyo Margo, is that a very fine fleeced Accoyo Cordero daughter. Macaria's granddam is the famous PPPeruvian Mariah, who also was the dam to SA ACCOYO ROYAL AVENGER, who sold two years ago for over $400,000. These are great genetics on both the dam and sire side! Leonard’s Accoyo Momo is a full Accoyo. She is beautiful, healthy crimpy female with a perfect conformation. She has a lustrous and dense white fleece and delivered a dark fawn cria. 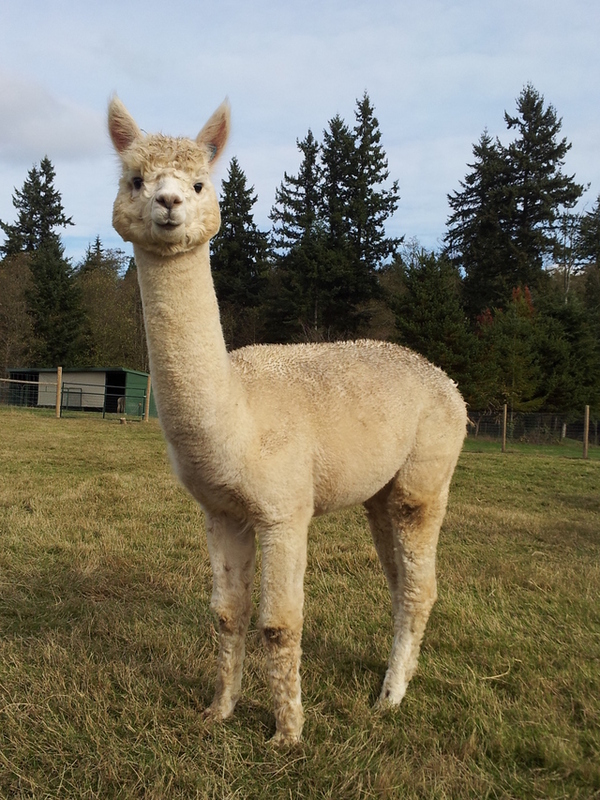 Full Accoyo Momo carries color genes from her sire, HPA Peruvian Leonardo. Leonardo is a beautiful medium fawn multiple blue ribbon winning full Accoyo herdsire, who has thrown fawns, browns, and blacks. Her dam is a 17 micron full Accoyo while female Victory’s Accoyo Macaria, who is beautifully statuesque, fine and dense. She was bred to Mary’s Accoyo Royal Beowulf, a rare dark fawn full Accoyo and a son of Royal Fawn. Beowulf is an extremely dense male who sheared 10.1 pounds in 2014 with 6.0 pounds in the blanket. In 2015, she delivered a DARK FAWN FULL ACCOYO FEMALE and proved to be a very good attentive mother with lots of milk. 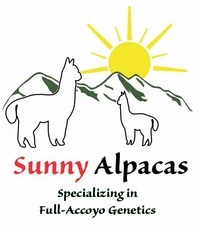 Her daughter, Sunny Accoyo Minaj, has a uniform, silky and crimpy fleece who represents a great blend of her sire and dam. 3 in 1, with a Accoyo boy, Breeding!